Availability If Out Of Stock: 1-2 days. The Photon XT 6.5S offers extreme versatility, featuring six red/green/white digital reticle options for a vast range of long-distance applications. Included are two crossbow reticles designed for 320, 350, 370 and 400 fps crossbows; two Duplex reticles for hog and varmint hunting; a Mil-Dot reticle for rangefinding and holdovers; and a German-style reticle. 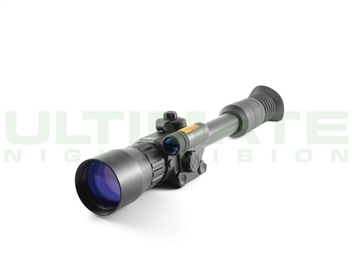 Its impressive 6.5x magnification, large 50mm objective lens and higher than average 640x480 resolution allows for optimal brightness and vivid detailing at up to 200 yards. Shooters have the ability to capture everything seen, day or night, through the video output feature, and attach additional accessories to the scope’s integrated weaver rail. The device also utilizes a digital windage and elevation adjustment system for guaranteed precision and an overall streamlined design. Whats the difference in the Photon 6.5S and the Photon 6.5L? There are 2 different versions of the Photon XT 6.5. The only difference between the 2 models is the type of infrared illuminator on each unit has on-board. The 6.5S model has an LED IR illuminator, the 6.5L has a laser IR Illuminator, and the 6.5L model is $50 more than the 6.5S. The laser IR on the 6.5L throws farther than the LED IR on the 6.5S, but the laser is much more grainy than the LED IR illuminator on the 6.5S which throws a nice smooth circular beam pattern. Both on-board IR illuminators offer less than enough beam throw and distance to allow the operator to take advantage of the Photon XT 6.5(S and L) impressive range capabilities. Both on-board IRs also have a fixed beam pattern, meaning there is no option to focus the beam pattern smaller or in a different direction. If you don't plan on using any type of external IR illuminator, it is best to choose the Photon XT 6.5L. The IR laser on this model consumes less battery power and offers better range. There is, however, an external IR illuminator option that offers incredible throw distance, a focusable beam pattern, and better battery life - the UNV 20-IR Long Range LED IR Illuminator. If you are considering the use of an external IR, then there is no need to spend the extra $50 for the 6.5L model. Go with the 6.5S, and add a UNV 20-IR. There are a few benefits to using an external IR illuminator like the UNV-20IR vs the on-board illuminators on the Photon XT line of scopes. First, the 20-IR will dramatically increase your usable range. Second, any external IR will dramatically increase your battery life since the onboard IR is not pulling any power from the Photon XT's battery supply. 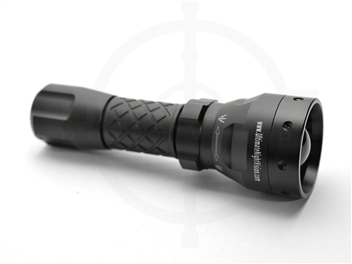 Lastly, the UNV 20IR is focuable, dimmable, and uses a rechargeable battery making it versatile and easy to use with other night vision devices. Average Rating: 4.5 of 5 Total Reviews: 2 Write a review. I have been using the Photon for over a month now and could not be happier. The ease of use with the scope is amazing, I was able to pick up the Photon and begin using it immediately. The on board IR light does a decent job for close distance shooting but the addition of an external IR light you are able to see a much further and clearer picture. I do have to say that the Photon XT 4.6 is a nice entry level night vision optic. For being what it is, it gets the job done for a lot less than other NV optics of the same level. I am prior Army and currently an LEO so I am used to using NV equipment on a regular basis. I purchased this scope to get back into coyote hunting. I used to use the big red or green spotlight once I called one in but now I can stay in complete darkness. As for quality it does need some improvements in a couple of areas. First off is the selector wheel. It is very soft feeling and does not have a positive feel for the adjustments. Secondly is the built in IR, it is very weak and a waste of space, weight and battery power. I would suggest getting a separate IR light to go with the scope. I would definitely recommend it to anyone looking for a digital entry level NV scope.